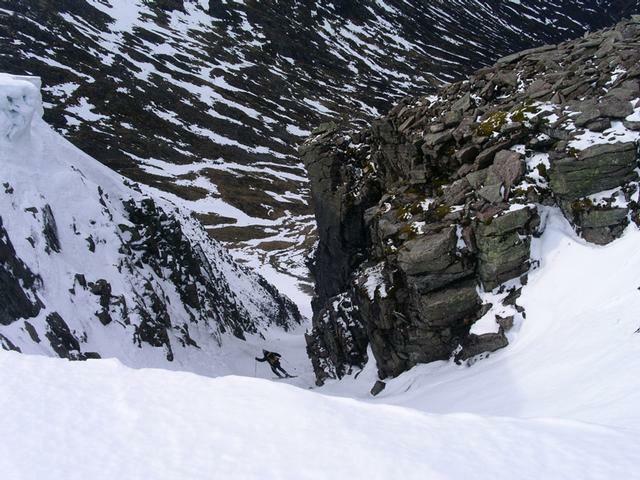 The remote Coire Cath nam Fionn is the main attraction of this mountain, offering 3 very obvious gully lines on Bheinn Bhrotain, and the potential for some interesting skiing on the face below Leac Ghorm on Monadh Mor. From leaving the bike at NN997897, you can head up over (or round) Carn Cloich-mhuilinn and onto the top. Quite rough going. Instead of cutting uphill, continue walking up Glen Dee, until a fork in the path by a very small cairn at NN986914. This path crosses the Allt Garbh and follows the North side of it. It is initially a well made path, but reverts to eroded heather before long, crossing back over the Allt Garbh higher up, Not long after the manufactured path ends, you may find the going relatively easy up the ridge that leads to the 1108m Eastern top of Beinn Bhrotain, If on foot, this would be the driest option. 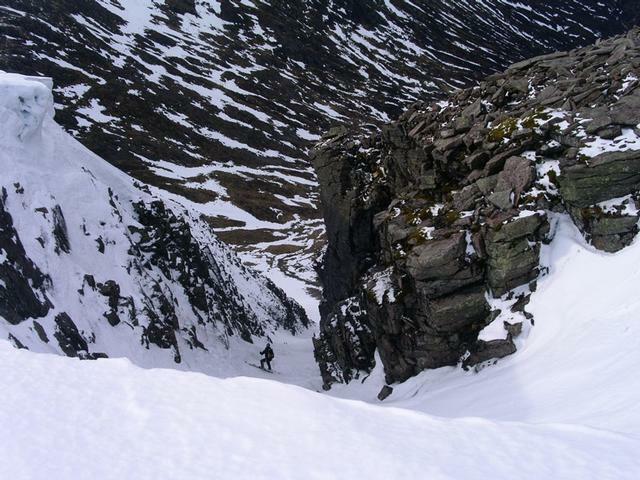 If on ski, heading up the Allt Garbh and into Coire an t-Sneachda may be best. The longest approach is to continue North up Glen Dee, and then round into Glen Geusachan, approaching the corrie from below. The path undulates a fair bit as it rounds the headland separating the glens, and can be a bit boggy, but has the advantage of allowing you to assess conditions from below. Locating the top of the gullies can be tricky as well, so in poor visibility, this approach would be best. As mentioned, care is required locating the top of the gullies from above, as they lie part of the way down a convex slope. 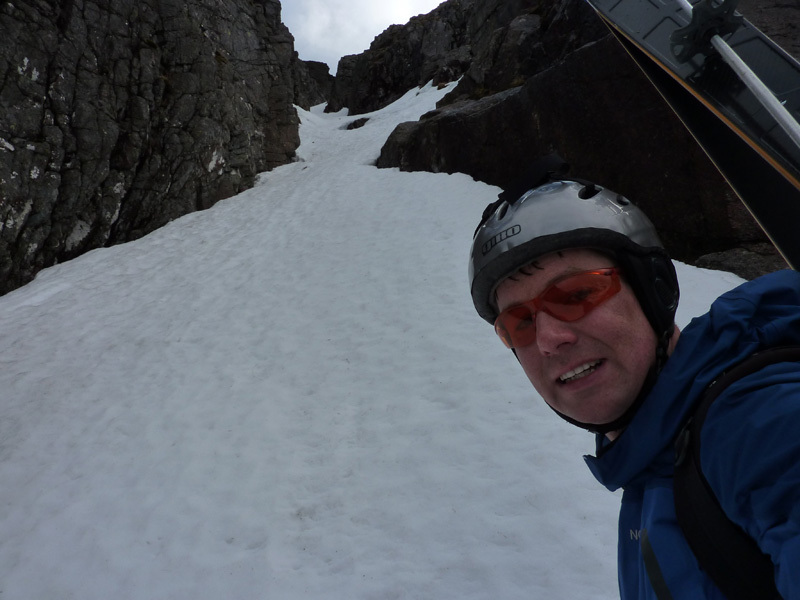 If you are feeling like you have some energy after skiing on the steeper runs, and are returning to Linn of Dee, the descent down the Allt Garbh is highly recommended as a shortcut to the trudge out of Glen Geusachan, as it holds snow well late in the season. There are 2 Scottish Avalanche Information Service forecasts worth considering for Beinn Bhrotain. 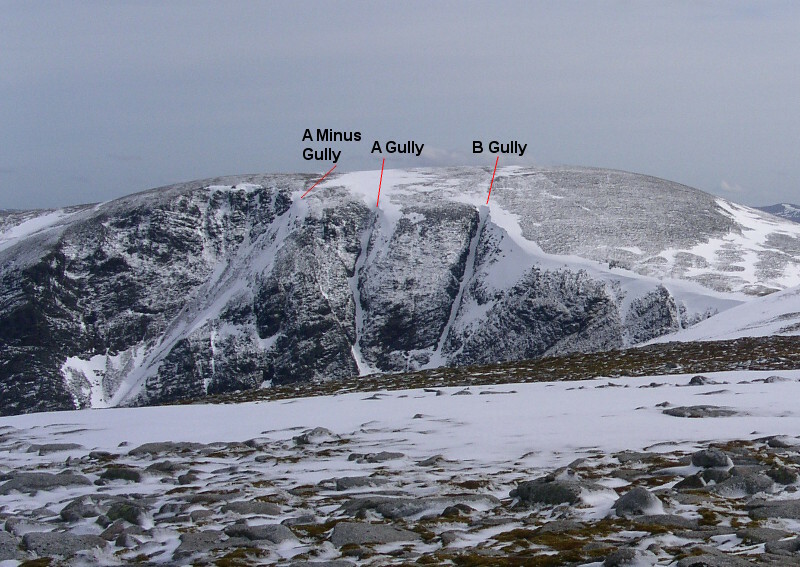 A Minus Gully is the longest, but least defined of the 3 main gullies. It is more of a small hanging corrie than a defined gully. It has a steep rocky wall on the skiers right, and an easier angled ridge on skiers left. This provides the easiest angled entry point. The angle soon mellows once in the gully, but it is overall quite easy for a Grade I gully. Lower down, the snow runs into a debris channel, which should extend the skiing out of the main gully line. Overall, it feels more like skiing an open slope, rather than a gully. A Gully is the slightly twisting parallel line to B Gully. 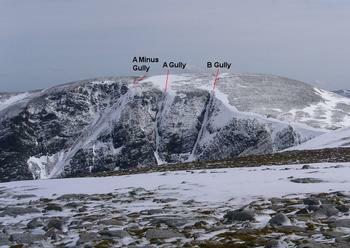 Generally wider than B Gully, with only a couple of narrow sections, it is again, quite easy for a Grade I ski. The entrance is as easy for the grade as you could wish for, with little cornice issues. As with B Gully, be aware of debris in the gully, and low down, there may be a slab of ice on the right hand side of the gully. 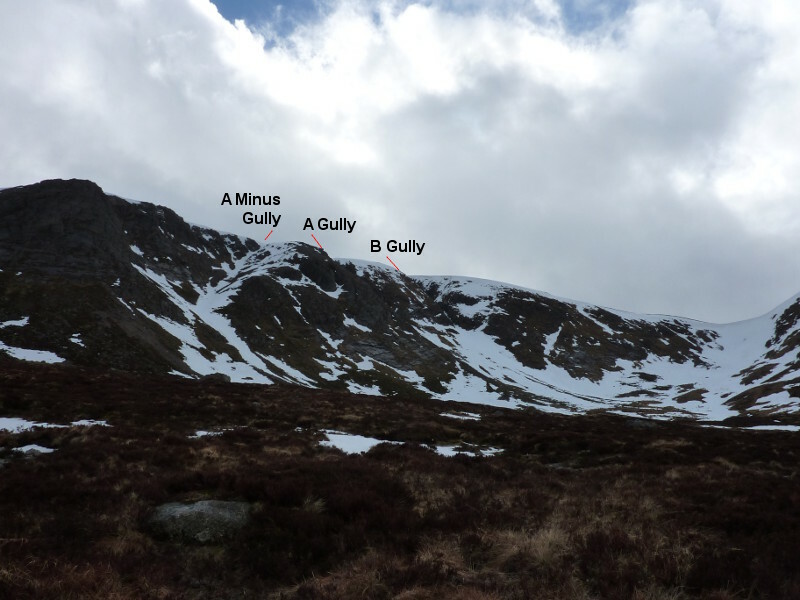 Both gullies hold snow well, but the scarp slopes below A Gully do not hang onto the snow quite as well as those below B Gully, so bear that in mind if you are flying out of it late in the season! This near enough perfectly straight slot is a fine companion to A Gully, and holds snow equally well. As with A Gully, it is well seen from below, or from Monadh Mor. Although fairly narrow, this is a relatively easy ski for grade I. The easiest entry is from skiers right. Be wary of angular lumps of rock in the gully following a thaw.